"Three Centuries of Harpsichord Making"
At some time in the late 1940's, on the occasion of a concert in Cambridge, I was told of two graduate students in English at Harvard who had built what I believe was a clavichord. Such reports usually arrive with an invitation to inspect a cherished and totally unplayable instrument. Having contrived politely to dodge the invitation, I never found out what the qualities of this instrument might have been. But not long afterwards it became perfectly clear to me that Frank Hubbard and William Dowd did not in any way embody the enthusiastic ineptitude that so frequently is to be encountered among those persons infatuated with old instruments. At about the same time it must have become clear to these two young men that there was a mission to perform, that a career in harpsichord building was at the outset more challenging and in the end perhaps more productive than one in university teaching. The pursuit of the Ph.D. was dropped, and the two separated for a period of apprenticeship. 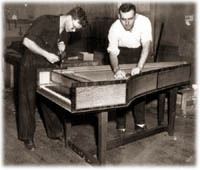 Dowd went to Detroit for a year to work in the shop of John Challis, whose work from the thirties onward, together with that of his teacher and predecessor of a quarter-century earlier, Arnold Dolmetsch, laid the foundations of twentieth century harpsichord building in the United States. Frank Hubbard, on his side, departed for England to gather what he could of the Dolmetsch tradition and to make a study of ancient keyboard instruments in public and private collections in England and on the continent. At the end of their period of apprenticeship, Hubbard and Dowd returned to Boston to collaborate in a partnership that lasted until 1958. From this they both emerged as consummate craftsmen, second to none in skill, intelligence, and experience, having accomplished the major revolution of this century in harpsichord building. This revolution was simply to return to seventeenth and eighteenth century traditions and principles of construction that had hitherto been practiced only in isolated instances. a Ruckers single manual harpsichord, in 1950. Without Frank Hubbard's historical studies this would not have been possible. These studies he pursued at intervals throughout his collaboration with Dowd and subsequently, to such an extent that he unquestionably knows more about the history and construction of harpsichords than anyone alive today. The bulk of this knowledge, guided by the disciplines of the scholar and illuminated by the insights and experience of the craftsman, is set forth in this book. Despite the proliferation of harpsichord builders since the beginning of this century, there has been regrettably little connection between most modern harpsichords and their supposed prototypes of the seventeenth and eighteenth centuries. Modern harpsichord building, since its inception by Pleyel and Erard at the end of the last century, has been largely in the hands of piano makers dominated by nineteenth century notions of technological progress. It has seldom occurred to any of them to question the assumed superiority of modern methods over the experience accumulated by the great harpsichord makers of an earlier day. (I long ago observed an inveterate temptation to reinvent the piano.) The traditions of an earlier day, however, were not easy to come by. Either they were buried in books and documents, hence inaccessible to the non-scholarly builder, or they were embedded in old instruments that for the most part had fallen into such neglect or that had been so badly restored that they exhibited few qualities that seemed worthy of admiration and emulation. Indeed, the condition of most old instruments would reinforce any piano builder's belief in progress. If builders were not always equipped to address themselves to the lessons of the past, scholars and musicians were not always equipped to guide them. Uncritical acceptance of historic instruments, without rigorous examination of their history of decay and restoration, has brought about some unfortunate "copies" and "authentic models." Moreover, sufficient insight into the manner of playing has often not been available either to scholars or musicians. There were of course remarkable and fortunate exceptions to these tendencies, most notably set forth in the early work of Arnold Dolmetsch and in the work of some more recent makers. But the time has long been ripe for a more adequate fusion of the scholar's knowledge, the musician's insight, and the builder's craftsmanship. To such a fusion, as represented by the constant interchange and cross-fertilization among American harpsichord builders, young and serious harpsichord players, and inquiring and knowledgeable scholars, Frank Hubbard has made an incalculable contribution. It is a matter of lasting regret that my friend Raymond Russell, whose The Harpsichord and Clavichord preceded this book, and who so generously shared his material with Frank Hubbard, should not have lived to see its influence and that of the instruments of his collection brought to such a flowering, one that by no means has ceased to unfold. The effect of this book for one reader, to speak for myself, has been to clear away many of the preconceptions and erroneous notions with which the aesthetic of the modern harpsichord has been burdened. It immensely clarifies the performer's ideas of the manner in which harpsichord composers used the instruments available to them, and it makes possible for the harpsichord builder a total and in many cases highly desirable re-examination of his craft. It is unlikely that a book will soon appear that will have such far-reaching influence in the harpsichord world. * Published in 1965 by Harvard University Press.